On a hot summer day, one of the best things you can do is just go underground. That’s what Jim and I decided to do the last time we were in Krakow. Part of the greater Krakow area, Wieliczka Salt Mine is an easy walk from the train station, so we headed in. Not only do we love salt, but this mine is famous for its salt carvings and statues as well as elaborate chapels and chandeliers. Built in the 13th century, the Wieliczka Salt Mine was inscribed on the UNESCO World Heritage List in 1978. 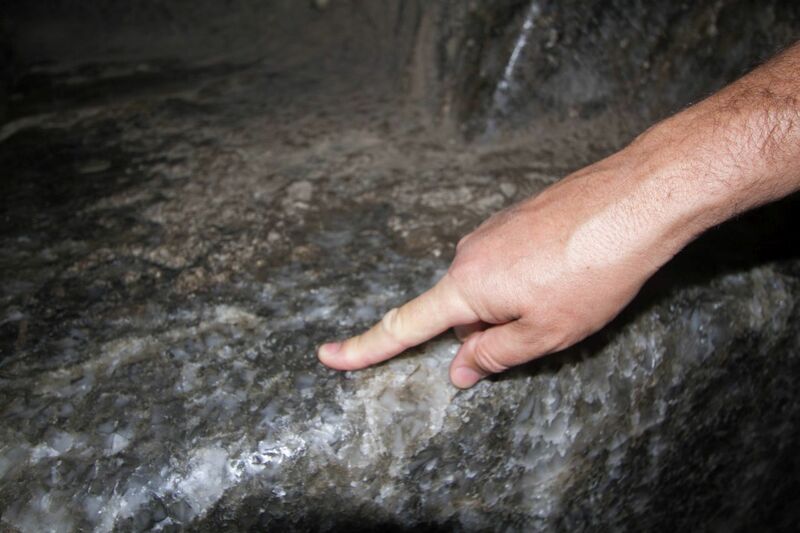 Considered a royal property, no longer does the mine produce table salt. Instead the elaborate network of tunnels and rooms holds music concerts, theater productions, has hosted filming crews, and in its tallest cavern even had a hot air balloon get off the ground. It’s a fascinating idea, to use the space and this unusual medium to produce works of art. Before going, I assumed that this was all done as a way to keep making money from a defunct business, but as it turns out the miners have been carving snowmen and other statues from the salt since the late 1800s. Today as you amble through and around, across the lake, down stairs and more stairs you come across room after room of displays. 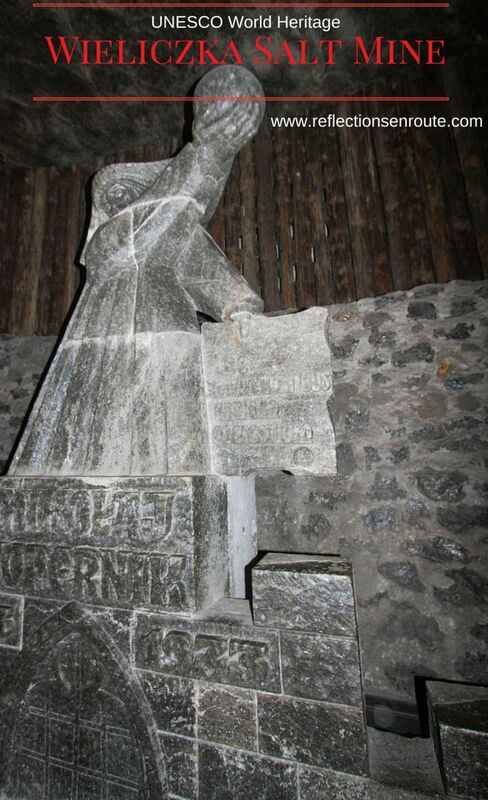 As one would imagine, Wieliczka Salt Mine’s history, important visitors, fairy tales, legends, are all told underground with salt reliefs, altars, and statues. It is such a unique and almost absurd idea that has become one of the most famous and most important cultural monuments in Poland. 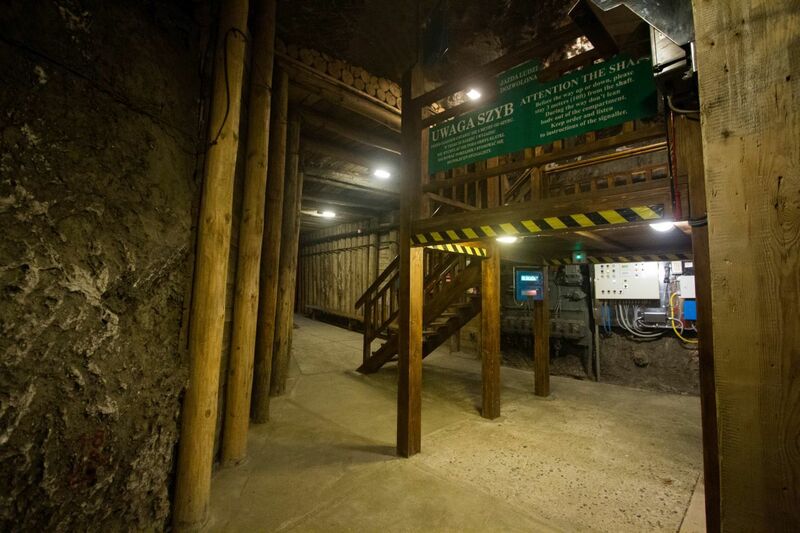 The mine could be its own community, and it is easy to spend the entire day underground. Upon first look, I thought Wow! Is it crowded? This is going to take forever, but even though there were lines cordoned off in at least three directions, they moved rather quickly. I did envy those that that had pre-booked their tickets. The lines were covered and there were plenty of seats. The initial entrance into the mine is a very deep shaft filled with over 700 stairs. The stairway is wooden and dark, and each step ahead of you is filled with people. As soon as you start descending, the stairs behind you are also filled with people. By three flights down, one girl ahead of me threw in the towel. She was claustrophobic and it was too much for her. 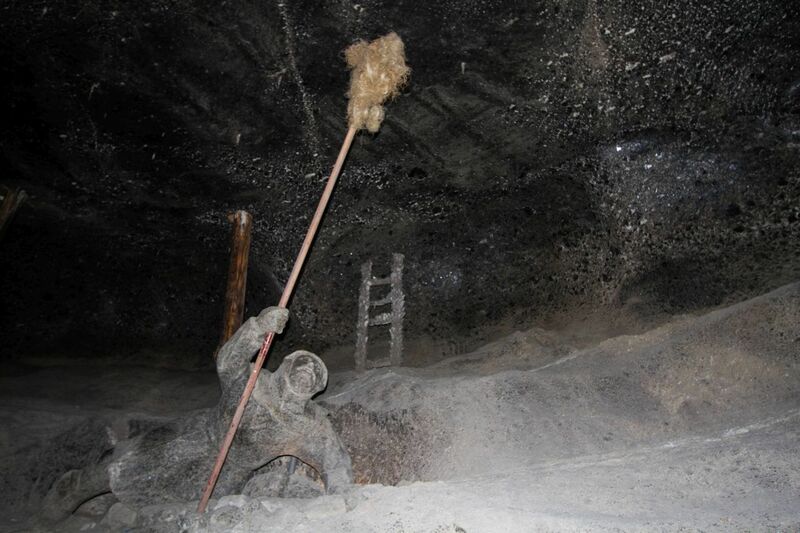 I tend to be a bit worried about tight spaces, but not enough to give up on going into this salt mine I’d had on my list for a couple of years. I just had to keep talking myself out of panicking. Once you finally reach the bottom, the rooms carved out of the rock are wide and spacious and had surprisingly high ceilings, so I was completely comfortable from that point on. Plus they promised us that we would ride an elevator up. 700 stairs down is one thing, but up…well, that’s another altogether. The tour lasts about two hours, and it was much more involved than I was expecting. 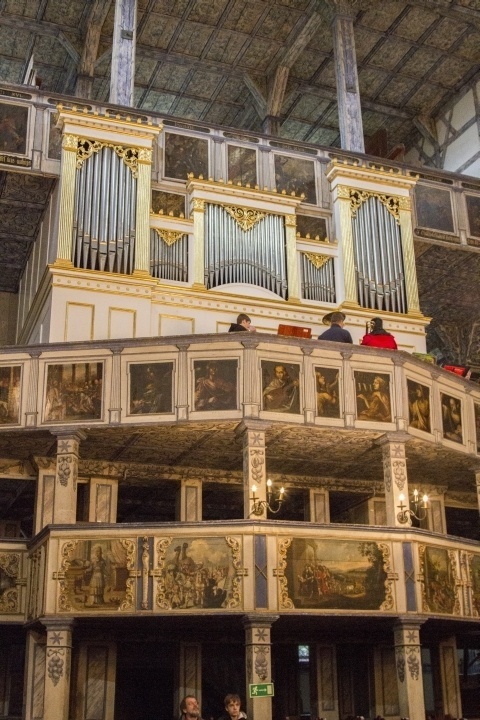 After having a fantastic time at the Salzwelten in Hallein, Austria we were expecting a mere walk through the history of salt, but it was much, much more. The services included a café and shop in one area, then a much larger shop, a restaurant, a play area, a museum with temporary exhibits, and I just can’t name all of the options. We had decided not to eat lunch there, but after we left and didn’t find anything in the area that even came close to comparing, we were a little miffed at ourselves. They offered local dishes, and the prices were quite reasonable as well. I would recommend future visitors to take their time and eat at the restaurant. Salt has always been a highly valuable commodity, and one of my favorite stories from the Wieliczka Salt Mine was about Princess Kunegunda. As the story goes, when she found out she was to be married to Bolesław V, who soon after became the Prince of Krakow, she asked her father for a salt mine for her dowry. He agreed, so she buried her ring in one part of Poland and it miraculously showed up in the mine. The Wieliczka Salt Mine certainly is not like any place I’d ever been before. What sets it apart is all of the amazing sculptures, rooms, events that have happened there. 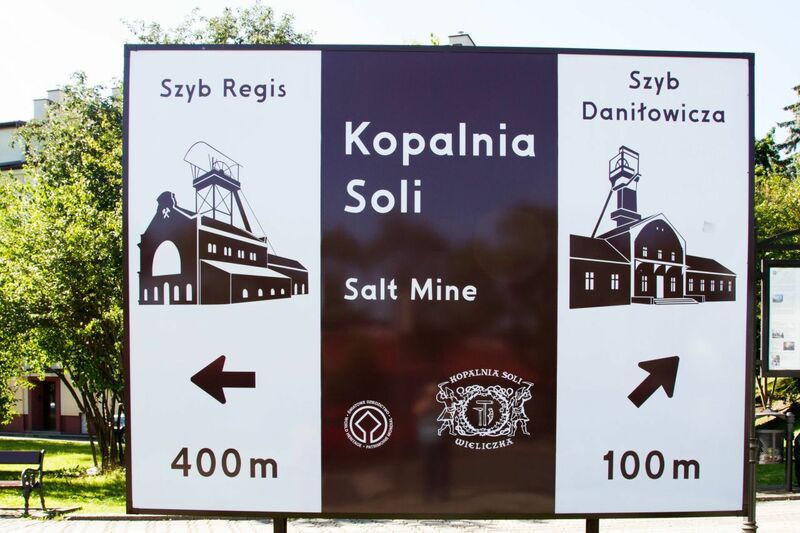 Since its beginning the people of Poland have really embraced the mine, and they love it. 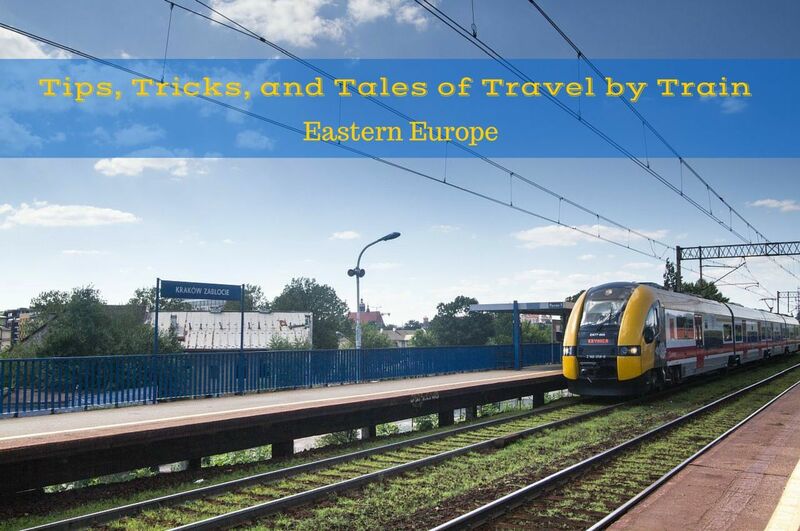 I highly recommend it to anyone that is going anywhere near Krakow. What do you think? Have you ever been to an underground art gallery? Do you think is salt one of the weirdest art mediums? Here in Missouri (the cave state) we have a cave used for wedding ceremonies called Bridal Cave. I was to attend one there one winter but an impending ice storm caused the couple to cancel and go to a local judge instead. The road to the cave was quite a downward skating rink we were told. Glad we didn’t get stuck there! Loved your post on the salt mine. Very cool! Stephanie, That would have been a beautiful wedding. Caves can be really fun! Jamie, I hope you do. It was really interesting! We visited a different salt mines at the Austria / Germany border (I would imagine you have been there too). The salt statues are really interesting, and quite wonderful. I would love to visit here someday and see the for myself. Rhonda, Even after visiting the other salt mines I was blown away by this one. Totally different and totally worth it! Suze, Yes. For me, it was a little tight and worrisome in the stairwells, but after that there was plenty of room. I loved it! 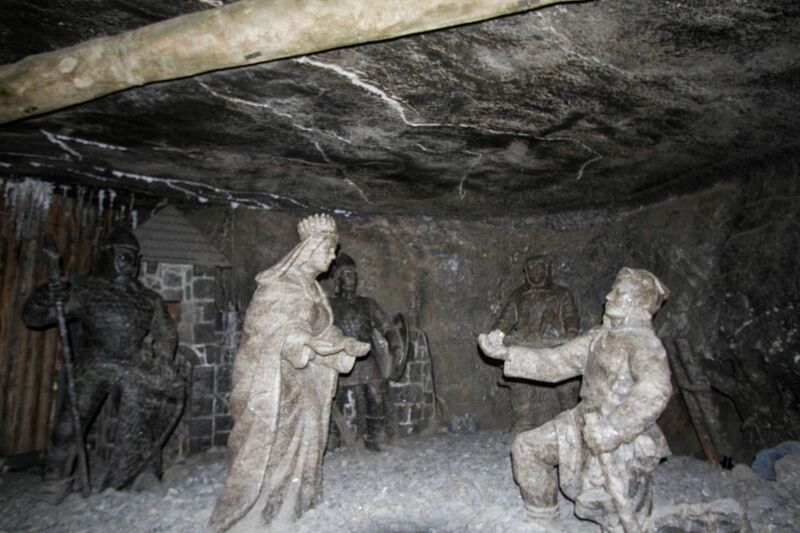 Wow never been inside a salt mine, this is totally cool …salt statues and story is interesting. Priya, It is much more interesting than I would have ever imagined. I hope you make it there someday! I didn’t know there were salt mines in Poland as well! We went to the one near Salzburg and had a blast. The kids got to go down the slides that miners got to take to down into the shafts. I love the story of the princess – unclear how that happened though – what does it have to do with the salt mine?? Shobha, She wanted the mine, because salt was a treasure. It brought in lots of revenue. Beautiful sculptures – who would have guessed it would be so beautiful down in a salt mine? Vicki, It was a surprise. Even though I knew I wanted to go and expected it to some degree, it still blew me away!